Bless the Christian Science Monitor. We’ve had how many years of thievery, incompetence, selfishness, dishonesty, unconstitutional governance, cravenness, criminality, cronyism, conspiracy, callowness, cowardice and corruption, and the Monitor asks people why they’re angry? You don’t need to ask that question anymore, though I’ll admit the article’s title attracted me. I wanted to see what other people say about the matter. Does a single system exist, and if so, what is it? What are the system’s components? How do the system’s components interact? How did the people who rigged the system accomplish that? How can people who want to reform the system, unrig it? Answers to these questions may appear self-evident, but in fact you would not find a lot of agreement about these matters among people who use Warren’s analysis. The great divide comes on the matter of remedies. When Warren makes the charge, she proposes to use government’s power to unrig the system. When progressive and conservative libertarians makes the charge, they propose to make government as weak as they can: for strong government – working with its allies – makes the system work in favor of the powerful and the wealthy. If you remove all power from the powerful, the system returns to an unrigged state. One last observation is appropriate. 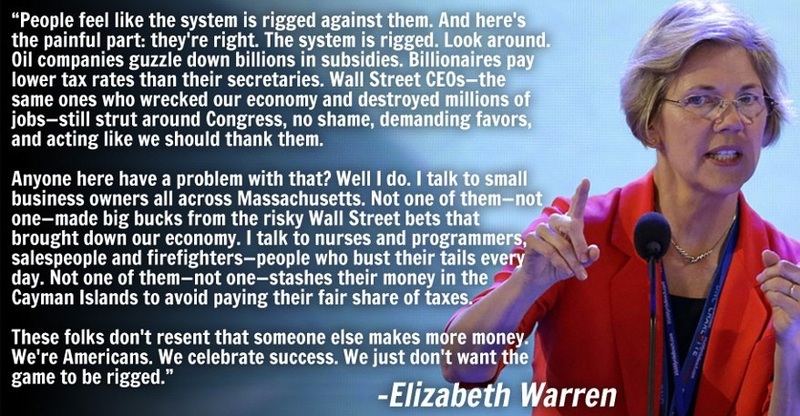 When Warren says the system is rigged, she means the system is rigged against the little guy – that is, against people who do not hold power and wealth. That’s often what people who adopt her phrase mean as well. She believes people in government who hold power are allies of people who do not hold power. That is, public servants, the powerless and poor share the same enemies: corporations and bankers. Public servants must increase their power to defeat these enemies, to prevent corporations and financial institutions from robbing the weak and poor. If you’re an Adam Smith liberal, you think, “Boy, is that ever a recipe for failure. That’s the reasoning that led to expansion of government power under the New Deal, and look what happened in that case. The more power government acquired, the more exploited little people became. The more government said they would help the weak and poor, the more liberty everyone lost. The more government claimed to work against privileged interests, the more closely they worked together with them. Everything about government’s good intentions turned out false.” And journalists wonder why people are angry? The financial scandal from recent memory shows the dreadful effects of state capture by privileged interests – interests government claims to control. In 2007 – 2008, financial institutions caused a panic within their own system. Government regulated these institutions to prevent that from happening, but it happened anyway. What is a panic? A panic follows an inflationary bubble, when paper, or digital wealth vanishes so rapidly that institutions and individuals no longer know the value of their own assets. They try to unload them as fast as they can, even though no one wants to buy them. Everyone faces bankruptcy as fake assets evaporate. Now, one strategy in a situation like that is to let institutions and individuals who bought fake assets go bankrupt. You would expect a government that defends the interests of the weak and poor to do just that. You would expect that especially if people who sold fake assets will go broke along with their customers. Did that happen? No. Financial institutions on the brink of disaster persuaded the U. S. Treasury Department and the Federal Reserve Bank to use taxpayer money to save them. They scared public officials with a ploy that amounted to a public threat or an ill-concealed bluff. They were too big to fail – that is, if they collapsed, the whole financial system would collapse. If that happened, the entire economy would follow. Thus they created a second panic on top of the first one. Anxious government officials, commissioned to protect taxpayers’ interests, turned over public assets to cover financial institutions’ fraud, and their own incompetence. The institutions had a pyramid scheme going, sustained by increasing real estate prices. When the pyramid began to collapse, they used public blackmail to make public officials do what they should never have done. Public officials permitted private financial institutions to loot the public treasury, except it’s not exactly theft when officials turn the funds over themselves. And people wonder why citizens are angry? They wonder why citizens think the system is rigged? Does the kind of collusion we witnessed during the period of double panic create a political environment where taxpayers want to give public officials a break? In fact, we see collusion everywhere: a thieving, conspiratorial, self-serving collusion that breaks all ties of trust between citizens, and the people who tasked to defend citizens’ interests. When two administrations, the first one Republican and the second one Democratic, pursue identical policies to save institutions that ought to have failed, we know the state does not serve the people who pay the bills. This collusion between public officials and groups powerful enough to capture public institutions is what most people mean when they say, “the system is rigged.” Enacting laws that would make public officials still more powerful, still more able to grant favors and assure survival, is not what most people imagine when they say we have to find remedies. Most people imagine that officials who have shown so much capacity for corrupt dealing in the past will not have opportunities for similar behavior in the future. To unrig the system, you have to remove the people who rigged it. This reasoning is based on a simple calculus. Taxpayers want good value for their money. This reasoning holds for property taxes. If you pay high taxes on your property, and your community’s schools consistently fail to accomplish their mission, property owners will be angry. Why do I send my child to school, when the training appears so inferior? Parents and property owners do not want to pay, and receive no value in return. The same holds for federal taxes. If you pay a large portion of your earnings to the federal government with every paycheck, and you see what amounts to theft and dishonesty on the part of public officials, your natural reaction is anger born of betrayal. Of course you feel the system is rigged if you work hard, and you see people who are supposed to work for you stealing your money. Anger increases if you feel helpless to do anything about the corrupt practices you witness. If the thieves practice their chicanery in the open – and all you can do is watch – who wouldn’t think the system is rigged? When you hear Elizabeth Warren make this charge about a system that does not work in your interest, then hear her propose that government exercise still more power to bring about reform, think about the likely outcome. Do you think granting more power to people already corrupted by power will make the system reform itself? Will people who already act on self-interest become more honest merely because we decide to entrust them with still more regulatory power? The only remedy for a rigged system is to restore power to victims of corruption. Victims of power do not need protection. They just need, and want, to keep what they earn. If citizens control public servants they hire to conduct public business, anger born of betrayal cannot last. Election 2016: Why is everyone so angry?